Finished up a first run of 1911 grips. Made these out of Red Oak. Red Oak you ask? I had a bunch of it… didn’t care how many I’d mess up while learning. 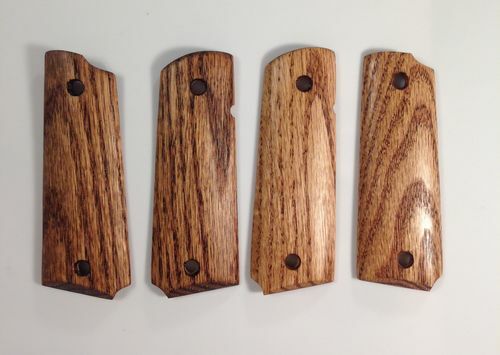 Top left is Truoil, top right are Tung oil, bottom are Natural Danish oil. Just seeing what I like. I have two more sets, 1 with Danish medium Walnut and 1 with Danish black walnut. My wife liked the darker color. I like the natural look of the wood lightly enhanced with the lighter finishes personally. Nice looking grips!! Are they for a Colt or a Kimber? Those look really good. I’ve been looking at replacing the grips on my carry gun from rubber/nylon to wood. Looking on the manufacturers website I found some but you’ve made me ask myself if I can make them. Thanks for the idea and keep up the great work! I enjoy making them personally. The only thing that I think can be difficult is placement of the holes. I have ended up buying a few specialty items to make it easier. A 15/64ths transfer punch, a 15/64th brad point, a 9/32nd brad point which I think is just a touch too tight and doesn’t allow for much wiggle room and also because it’s lipped doesn’t make the best counterbore so I got a 9/32nd counter bore, still very tight so I just ordered up a 19/64th counterbore. It’s just big enough to allow wiggle room. I am still playing with which to use for which side. Very nice! Gives me an idea for one of mine. This is a beautiful collection of gun grips. Very nice. Let me know if you start selling them! Funny you should ask. I actually am/will be selling them. I opened an Etsy shop. Only have 1 set up in order to open the shop and claim my shop name. It’s a blem set. One of the counterbores isn’t perfect so I said as much. Got to be honest so if someone buys it there is no surprises. Those are the Black Walnut and Medium Walnut. They were still bleeding so I figure a coat or two of clear poly will seal it enough. 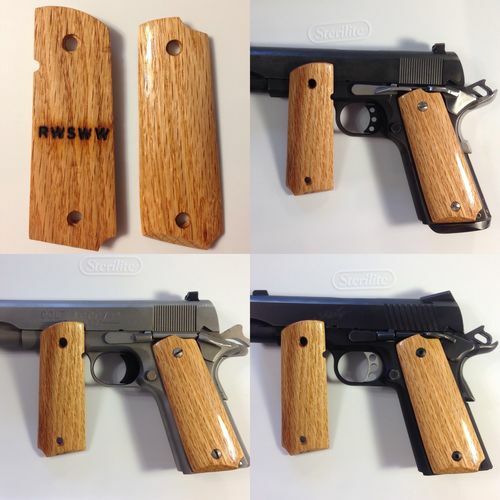 About 30 years ago I made similar grips for S&W semi autos. I worked in law enforcement at the time and when co-workers say my grips I started getting requests to buy them. I couldn’t keep up with the demand. I found the best finish was a rifle stock finish (Tru-Oil Gun Stock Finish) available in most sporting and gun supply stores. It produces a great finish but even better it can be renewed by buffing with 0000 steel wool and apply a new coat. I still have those grips on a couple of my guns.